Often, I’m asked by my Facial Rejuvenation patients about how long their face lift may last. I’m reminded of the French surgeon Dr Vladimir Mitz, a pioneer in anatomy regarding facelift surgery, who told me once he had a crystal ball on his desk to answer such a question! At the time, I hadn’t appreciated how profound this idea was. It makes a lot of sense to me now. Why? Wrinkles: tensing and tightening facial muscles squeezes and pinches the overlying skin, creating wrinkles and lines. Acne: hormone receptors connected to the oil glands are triggered by stress hormones, so once they’re stimulated, the gland increases oil production, causing pimples and breakouts. Grinding teeth: jaw tension will create lines and wrinkles as skin is pinched and collagen is broken down. Increased free radicals: stress causes blood vessels to clamp down, causing a shunting of blood away from the skin as blood focuses on internal organs. Lack of blood leaves skin vulnerable to assault from the sun, cigarette smoke and other outside pollutants that create free radicals. As an example of what stress is capable of, we have all seen people who have lost their loved ones and 6-12 months down the track they’ve seemed to have aged 5-10 years; their skin is more wrinkled, dry and sallow looking. 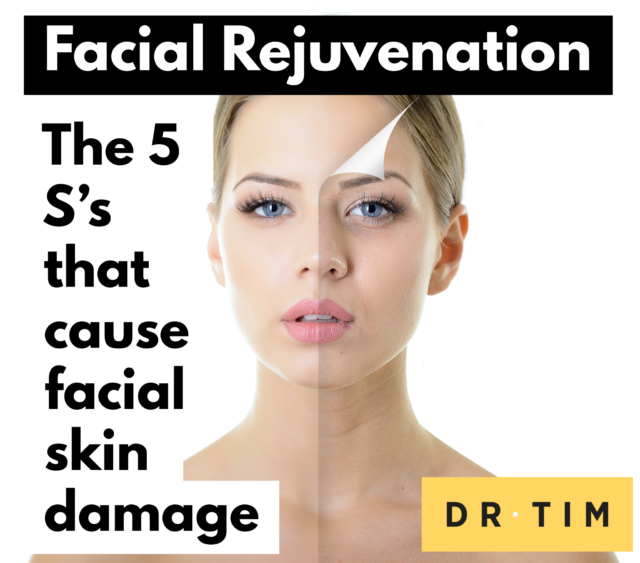 Imagine if you throw in the other factors like sun exposure and smoking and you can see how they can aﬀect the longevity of a face lift. That’s why it’s like looking into a crystal ball. I say to patients that a face lift usually lasts 7-10 years if you are lucky and maintain it with regular microdermabrasion, skin peels and laser skin tightening. Use regular sunscreen to protect your skin from free radicals from the outside world. Use antioxidants either applied topically or consumed orally such as vitamins A, C, E, lycopene, CoQ10, idebenone, green tea and grape seed extract. Take Vitamin B to stimulate hair growth. Relax. Calming your central nervous system and mind to give stress hormones a chance to switch oﬀ is a good thing. Try meditation, some quiet time or exercise. Anti-wrinkle injections. These injections not only make you feel better when you look your best, but medically they help muscles relax. There is a biofeedback between muscles and the brain, so if muscles aren’t tense, the brain interprets the quietness as calm and lets its guard down. Question: What do you do for facial rejuvenation to prevent facial aging? You can leave a comment below.